It’s exactly what it sounds like. A “handyman property” or “handyman home” is a home that is sold as-is, in a condition that may require a bit more TLC than the traditional home on the market. 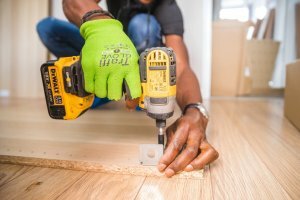 Oftentimes, you’ll hear them referred to as “fixer-uppers.” Fort Collins handyman properties are a great way to get a big bang for your buck, as many only need a cosmetic facelift and buyers are eager to purchase move-in ready homes. Avoid homes requiring major repairs. As you know, repairs can get costly and will eat into your profit margin. NOCO Invest always recommends a thorough, professional home inspection prior to investing in any property, but especially in regard to handyman properties. Also, remember the #1 rule of real estate investing: location, location, location. A less desirable home in a more desirable neighborhood is better than a highly desirable home in an undesirable neighborhood. You can always improve upon a home; however, your sales and potential tenants will always be driven by the neighborhood and nearby schools. After having your Fort Collins handyman property inspected, you’ll have to study the costs before deciding to sign on the dotted line. While you likely can do most of the work yourself, know there are always hidden costs when fixing up a home. Our rule is to always anticipate an additional 10-25% in unexpected costs above your estimate for unforeseen improvements and repairs. As a Fort Collins handyman property investor, you won’t have to live long with the former owner’s taste before jumping in and remodeling. With a handyman property, you’ll be able to get to work right away to make your investment reflect your preferences in features and style. A word of caution, however: go easy with the customization if you wish to maximize your return on investment with this type of property. Renters or buyers who don’t share your style might not be quick to lease or buy a home that is too far “out there”! Choosing smart upgrades will instantly add value to the home and make it desirable for all. Standard upgrades include rehabbed bathrooms, carpet, and kitchens. Turning an undesirable handyman property into a sought-after dwelling can earn you an unbelievable and substantial return on your investment. Keep in mind that in order to achieve the maximum return on your investment, you’ll want to ensure that your property strikes a balance between standing out from the competition in the neighborhood, while preserving your rehab budget. If you’re in the market for a Fort Collins handyman property, look no further than NOCO Invest. We have an insider’s advantage to help you find Northern Colorado investment properties at 30-50% below market value. Contact us to learn more about how we can work together to help you find the perfect Fort Collins handyman properties to resell or rent!